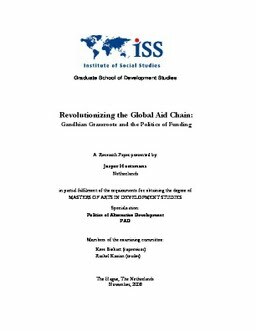 This paper questions the transformative potential of the current aid-led development paradigm and attempts to identify radical spaces for grassroots NGOs and private aid agencies in the establishment of new partner relations in a beyond aid paradigm. Not only is development as non-market and non-state space under pressure by shifting state priorities and the rise of corporate social responsibility; the de-politicizing, immobilizing and homogenizing effects of conventional aid channels form strong incentives for grassroots spaces of resistance to look for alternative relations with private aid agencies. The paper draws on notions of the aid chain, injected with the concepts of structural power and radical space, to form a framework within which spaces of potential transformation can be identified. Conclusions are drawn on the base of a case-study in India to provide a case of how grassroots NGOs established alternatives to the dominant aid system that challenge capitalism. With transformative forms of self-finance, like local-oriented, small-scale and non-profit manifestations of fair trade systems and inclusive networks of membership and volunteering, grassroots NGOs can raise radical spaces that structurally challenge capitalism. This grassroots perspective implies an alternative role for private aid agencies that shifts from the exclusive function of aid distribution to more constituency-based forms of knowledge networks, platform creation and alternative development education on one side and more independent and structural forms of advocacy and campaigning towards the hegemonic holders of power within neo-liberal regimes on the other side.